On Friday, I drove the first part of the course. There was heavy rain all the way from Irvine out to Redlands. Not looking good. Jack Rabbit was in pretty good shape except for 30 foot long lake at the end. This covered the entire road from side to side and was at least 8 inches deep in the center section. So I scouted two alternative routes, met with Robert, and we decided to change the route up San Timeteo. Weather Page in LA Times showed Big Bear had a low of 30 and a high of 37 on Friday with .26 inches of rain. Saturday had a low of 25 and a high of 41. Sunday's Forecast was for a low of 26 and a high of 52. My conclusion was that the Weather could be a real challenge on this ride. So that means hauling Winter Gear: Tights, Arm Warmers, Long Fingered Gloves, Vest, and Windbreaker. So I packed my HUGE Blackburn Seat Pack in order to have room to haul all the clothes. 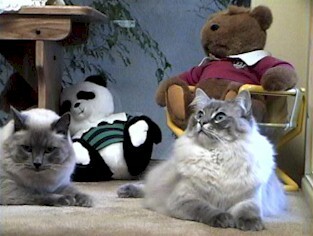 On Sunday morning, Max and Logan were wide awake at 3:30 A.M.
Everyone else in our house was snoring big time. I had a ton of stuff to get together for the ride. 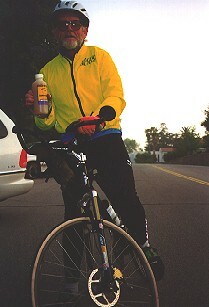 I ate a huge breakfast of a Power Bar, Waffles, Opti-Fuel 2, and washed it down with a couple of cans of Ensure. Left the house at about 4:45 and arrived at Sylvan park at 5:45. This was a day many of us had trained for all year long. This was a day where all of the pain from Robert's "Torture Clinics" would pay off. Where the horrible Torture of Tuesday Time Trials, Intervals, and Hill Repeats would be put to the test. This was certainly going to be a day of challenges and testing. 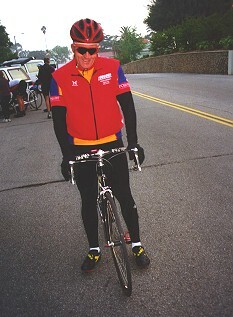 At the ride start at Sylvan Park, Dave Evans was waiting for me -- he had already twisted my arm into an early start so he could make it to Onyx Summit before the Cutoff Time. At 61 Years Old, Dave has completed well over 30 Double Centuries. Dave is an extremely experienced Mountain Climber and has seen all kinds of horrible weather at the top of mountains -- even when it's nice at the start. Dave left with a big smile on his face at about 6:00 A.M. -- fully prepared for any kind of weather. Team President John Burgess was looking good here and ready to roll out!! John is well prepared with enough clothes to take him high above the clouds. It was great to get to check everyone in at the start and get to know some new riders I hadn't met before. The big surprise was seeing Brian and Debbie Matthews arrive with their TANDEM!! Now this is not a tandem friendly course -- but this team was ready to do it!! In fact, no tandem team had ever attempted this ride in the prior two years!! My hat is off to the Matthews: in fact, Debbie is in the final month of training before setting out on a Bike Ride Across America!! Joe Mastro was having some bad luck. As he was about to take off, his chain broke. Fortunately, I had picked up a "Topeak Alien" Tool Kit which is an amazingly small and light set of tools that includes a Nine Speed Chain Tool. So Joe was back in business pretty quickly. I was glad to be in the right place with the right tool. My good buddy, T.K. Gardner, showed me his "Alien" and I was hooked. I left with Greg Knight, Randy Grisham, Walter Myers, and Pete Smith at 7:18. Time to turn on the flight recorder. It didn't look like Robert Rayburn was ready to leave for awhile but he quickly caught up with us and we were glad to have his company and his help in the paceline. When we left, Coach Robert Kahler was still in his Sweat Shirt and Tennis Shoes doing the final work on distributing the food for the Rest Stop volunteers. 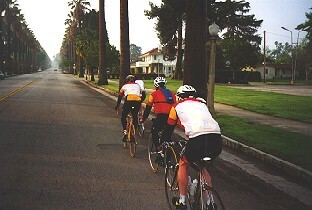 The homes in Redlands were beautiful as we rode by getting warmed up. Fog on San Timeteo Canyon Road was thick with only a little sun peeking through. A steady climb for 13 miles. Outstanding paceline all the way up into Beaumont. Good steady pulls and great teamwork -- I thought to myself: boy I really miss this kind of teamwork after having ridden many early season on the PBP Brevets where everyone is very much spread out and there isn't much teamwork. I enjoyed singing "Hurt So Good" in the paceline as my Heart Rate Monitor was going off the Richter Scale. In the distance, we saw Hugh Murphy riding. Today was Hugh's 51st Birthday so we started singing Happy Birthday to him as we came up behind him. It was a fun surprise for him. 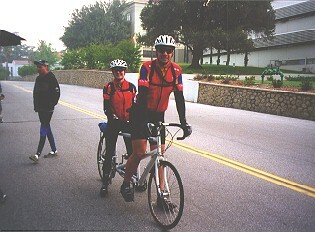 Hugh has organized many Century and Double Centuries in California and was a big help on this ride today. But today, Hugh got to ride -- and he loved every minute of it!! Coach Robert and Matt Forquer came up next to our paceline. Now how does this work? Here we were working hard -- my Heart Rate was 180-185 most of the time -- in a great 6 man paceline. Robert and Matt left from the start about 10 minutes behind us. Robert rode up to us 30 minutes later like it was a slow stroll through the park. I was Blue in the Face, gasping for breath, at the back of the paceline. Obviously, Robert and Matt were working well together. All the same, making up that kind of time using a 2-man pace line vs. a 6-man pace line was very impressive. Well, it wasn't long before there was smoke coming off Robert's Rear Wheel and we waved BYE BYE to him, Matt, and Pete as they rode off into the sunrise. Pete was cranking on all cylinders for sure. It was best that we didn't follow -- we knew that could be the start of an early Nuclear Meltdown and we needed to leave some in the tank for the miles and mountains to come. 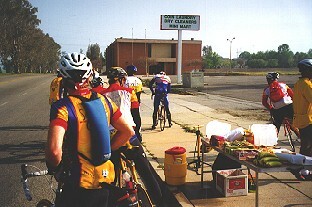 The remaining part of our paceline all came into the first Rest Stop in Beaumont together. Matt and Andrea had a lot of customers here all at once. It was great to see everyone and we appreciate Matt and Andrea's hard work here. At this point, my Avocet 50 showed we had climbed 1,420 Feet in the first 17 miles. Up ahead is the infamous Oak Glen Climb. A brute of a climb that just goes up and up. This climb includes the steepest parts of the course.